The fossilised remains were excavated in Central Otago on New Zealand’s South Island, from sediment left over from Lake Manuherikia that existed in the Miocene era, around 16 million years ago. The Mystacina bat genus was thought to have a long ecological history in New Zealand, having originated from Australia, but the oldest bat fossil before this new discovery was dated to only 17,500 years ago. 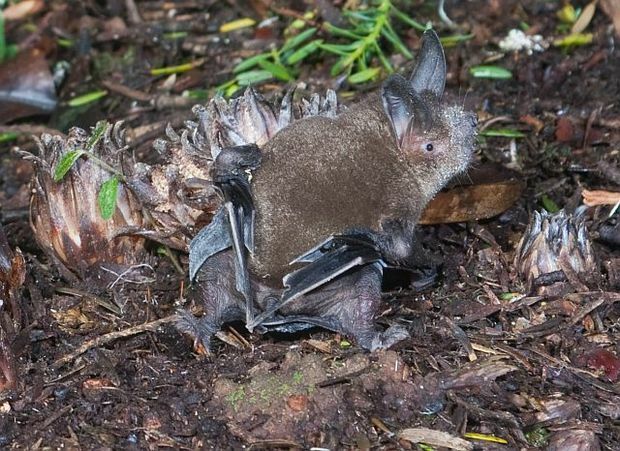 Many bat species are involved in pollination and seed dispersal in tropical ecosystems, but in New Zealand only the semi-terrestrial M. tuberculata fulfils this role, feeding on the forest floor as well as in the air. The bat new fossil reveals a much longer evolutionary relationship between forest ecosystems and the semi-terrestrial bat than first thought. Plant and arthropod fossils found close to where bat fossils have been found are also closely related to modern species. “Our discovery shows for the first time that Mystacina bats have been present in New Zealand for upwards of 16 million years, residing in habitats with very similar plant life and food sources,” says lead author and paleontologist, Associate Professor Suzanne Hand from the University of New South Wales in Australia. One of few bats in the world to spend most of its time on the ground, the lesser short-tailed bat folds its wings under a leathery membrane to keep them safe. Using forearms as front legs, this grey-brown velvety bat scrambles shrew-like on all fours to take advantage of terrestrial food sources. Known as the burrowing bat, it has talons that facilitate searching leaf litter and digging burrows, as well as climbing trees. Similar specializations of the wing, foot, leg, spine and pectoral and pelvic girdles in the lesser short-tailed bat have also been identified in the M. miocenalis bat fossil. A similarity in molar structures suggests the ancient relative also had a similar diet of insects and terrestrial arthropods, fruit, nectar, and pollen. However, with an estimated weight of 40 g, the ancient bat was three times larger than its modern cousin. According to Hand, bats need to be small, quick and accurate to chase insects in flight in the dark. This bat was unusually large which suggests it was hunting less in flight and taking heavier prey and larger fruit from the ground compared to its living relative. Associate Professor Daphne Lee from the University of Otago and Dr Trevor Worthy from Flinders University in South Australia were co-authors in this study. The bat fossil discovery helps the understanding of how bats establish island populations, “important for evaluating biosecurity threats and conservation priorities for fragile island ecosystems,” said Hand.